The Tingari were a group of ancestral beings that emerged from the earth and conducted activities that led to the formation of the landscape and it’s inhabitants. The content of these ancient stories remains the exclusive knowledge of the initiated men. 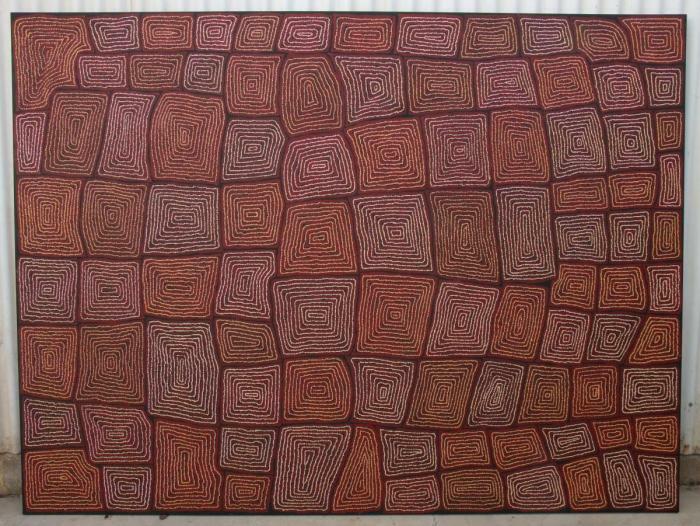 The symbols used in this painting are typical of the designs found on Pintupi artefacts such as shields and spear throwers as well as cave paintings and rock petroglyphs. 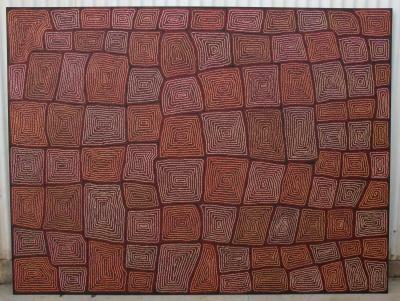 This painting depicts “tali tjuta”- many sandhills of the Marruwa area west of Lake McKay. More specifically the painting refers to a particular site known as Wanapatangu, which is recorded as being northeast of Wilkinkarra (Lake McKay) in Western Australia. This is one of the locations where the Tingari ancestors stopped for ceremonial and social activity in their long journey across the desert and now remains as a significant ceremony site for the Pintupi men. 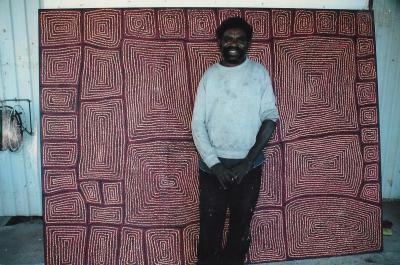 Thomas, or Tamayinya, was born in the Gibson Desert at Marruwa, Western Australia around 1964. He is one of the four men from the famous group of nine Pintupi Aborigines who suddenly emerged from the desert in 1984 and are known as "The Lost Tribe". When his older "brother" Warlimpirrnga rose to stature as a famous painter within a few years, Thomas and his half brother Walala also bega . . .